In a surprising move, Sony announced the revival of its Aibo robodog series towards the end of last year. Despite a hefty price tag, the company ended up selling plenty of them in Japan, following which they have now announced the arrival Aibo revival in countries other than Japan. 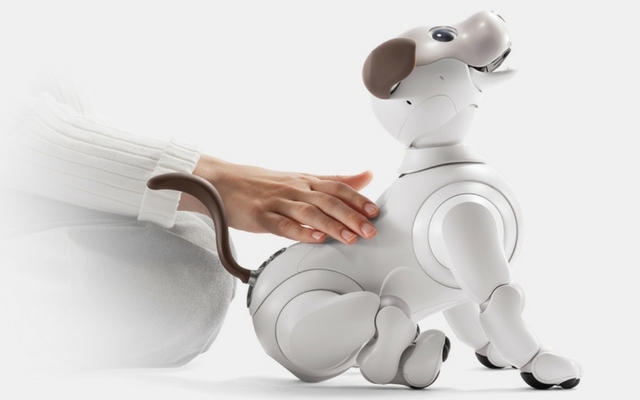 And it is safe to say that Sony managed to stir up quite a commotion with Aibo amidst all the same old gadget announcements at CES this year. It is hard not to fall in love with this adorable little robo-puppy at first sight. If you ignore the shiny plastic coat, Aibo is surprisingly lifelike. Heck, it even has OLED puppy eyes which are very effective in convincing you. It has 22 points of articulation and various motion sensors that allow it to interact with surrounding humans and other Aibo dogs. Aibo’s nose houses a camera with which it can identify different people and watch where it is going. Apparently, Aibo will act differently depending on the person it’s interacting with. So don’t be surprised if your friends’ Aibo refuses to accept your command and only keeps wagging its tail. The ‘robopup’ is powered by a quad-core CPU, and comes with built-in LTE and WiFi, plus the requisite sensors that it needs to move around freely. Its microphone setup allows you to give voice commands, while speakers are used to deliver the responses. Sadly, a bunch of Aibo robots failed to respond to some commands during Sony’s press conference. It could either be due to the bad connectivity or maybe they’re just pre-production units with some bugs. So we don’t exactly know everything that it is capable of doing, yet. Now that you know mostly everything about Aibo, let’s talk pricing. As mentioned earlier, the Aibo will arrive at the Japanese markets before it makes its way into any other region. It is priced at 198,000 JPY which roughly translates to about $1,735 or Rs 1,12,000. Apart from that, Sony will also charge you $26 per month to keep the robot pet connected to its cloud, updated and running. Now the $2,000 question: Is it actually worth the asking price? When it comes to practicality, it is just a robot dog that’s made to impress you at first sight. So, it’s hard to tell how much value it can add. In a time when we are surrounded by AI-powered smart speakers and other connected devices, the Aibo is indeed quite refreshing – though we would have to say a speaker makes for a better virtual assistant than a robot dog. It’s not going to replace your pet, it is tough to turn a blind eye towards this cute puppy!